In the last few weeks, our beekeepers got some new competition. Morgan Freeman – the acclaimed actor, director, philanthropist and now beekeeper – has converted his 124-acre Mississippi ranch into a bee sanctuary, helping to put dwindling bee populations in the spotlight. Turns out, Freeman has been beekeeping since 2014. He has long recognized the urgent need to preserve nature’s most potent pollinator for the sake of our environment, but he’s dialing up his activism in response to the mass bee die-offs in recent years. Freeman’s confidence with beekeeping started early on. Just two weeks after he started, he was already feeding his hives without wearing a beekeeper suit. He claims he just doesn’t need it, saying “You have to resonate,” and the bees won’t even think of stinging. According to him, beekeeper suits are for “people who can’t resonate,” but we’re willing to bet that it’s just his golden voice calming the bees. Freeman’s sanctuary began with 26 hives that he imported from Arkansas to his ranch in Mississippi. Today, he’s up to 40 hives, with plenty of room left to expand on his ranch, which is well-stocked with pollen sources that any pollinator would love: clover, lavender and magnolia. But the A-lister is just one beekeeper among many, and together they make a huge impact by helping to maintain bee populations around the world. Hobbyist beekeeping is on the rise, with more amateur beekeepers joining the cause and setting up their hives every year. So, how can you be more like Morgan? Start a hive of your own: there are guides for beekeeping in every corner of the country. But keep in mind, even if you’re confident that you can “resonate” like Mr. Freeman does, we recommend beekeeper suits for any first-timers. 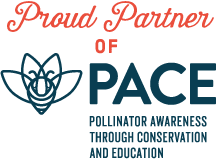 If you’re looking for something a little more low-maintenance, consider planting a pollinator garden or supporting local beekeepers by purchasing raw & unfiltered local honey.